1st: 1-6-2-4-3…Simply Great (1) gets a slight nod, with a hot rider. Made a nice bid in the last two and hung. Hope that’s not a trend. Run Juja Run (6) is a NY-bred for Jinks Fires, who has been working very good. Parking Ticket (2) drops from MSW, where she hooked a couple of nice ones. I bet 1-6-2 in exacta box and 1-6-4 in exacta box. Flipping it up, I bet the 6 to win/place. 2nd: 4-5-1-2…Merilore (4) drops for a hot trainer and gets a nice rider change. This one hooked some good ones two back and if she runs that race back, she handles these. Baetykaty (5) also gets class relief for a trainer starting to shake off the webs. Has speed and that helps in this spot. It’s a Journey (1) drops for a solid outfit and comes off a nice vacation working very well. Have to use here. Ritzy Lass (2) moves up off the claim for new owner/trainer combo, who know what they are doing. I bet the 4 here to win/place and box 4-5-1 in exactas. Key the 4 over/under the numbers, too. 3rd: 5-6-7-2-1-3…Sassy Little Lia (5) loves a giving turf for a trainer that continues to win everything in sight. Burma Road (6) is very good right now and has speed that will carry. She handles a soft going, too. You Cheated (7) was 27-1 odds in last and nearly won at Keeneland, despite a wide trip and beat a nice one at TP two back in Eqho. Watch out. Flying Tipat (2) prefers firming going that what she may get today, but is by the world’s hottest sire. I bet the 5 to win/place/show and key over/under all the ones above. Small 5-6-7 exacta box, as saver. 4th: 2-6-5-3…Manhattan Mischief (2) gets the “dot” (must use) here. Hottest trainer at the meet so far and has the speed to burn and is OK in the mud if it continues to rain. Picks up a rider shipping in for today, and he can ride. Fourth of July (6) is a true closer, who has hit board 11 of 18 starts. Favorite Coach (5) goes for another trainer who can get them ready in the afternoon. I bet the 2 to win/place and key over/under the rest. 5th: 6-2-1-5…Scarf it Down (6) drops in class and the dead closer looks very solid in this spot, for sure. Gridiron Cat (2) goes for Brad Cox. Enough written. But this barn wins with a .38% on first after claim. Calmbeforethestorm (1) gets back to the track he loves after a hiatus overseas. Welcome home. I bet the 6 to win/place and box the top 3 in exacta; then I box 6-2-5 in exacta, as well. 6th: 2-3-6-1-8-4…Dancing Waves, an Irish-bred who grew up on soft going- gets the “dot” in this one for Brad Cox. If she runs back the same race as last, she wins here. Savannah Belle (3) is a dead closer with a killer kick. Jock-Trainer combo is solid together. Don’t dismiss Dreamcall (6) here. First time grasser may be very tough in this spot, as well, and gets a veteran rider who has rediscovered his magic touch. I bet the 2 to win/place and they box the 2-3-6 in exacta. I key 2 over/under in exactas with the rest of them, too. 7th: 6-1A-3-2-5…Quiet Man (6) gets the “dot” here. Very consistent performer, who drops in class for a solid barn operation. Bob’s Gone Wild (1) is a 9YO for the hottest barn on the grounds and I just love the name for his old guy. Copus (3) has speed and in this spot that is dangerous. I bet the 6 to win/place and then box the top 3 and box 6-1A-2 in the exactas. Tread lightly here. 8th: 5-3-7-1-4-6…Solve (5) drops off the claim, which is an interesting twist. The last two are horrible and he stopped in both. But if he comes back ok, then he wins. Either first or last. Aurora’s Kid (3) is a safer play and ran a good one here in last. Watch Me Smoke (7) is a Louisiana-bred who tackled restricted stakes race in last. Trainer has good numbers in a limited number of starts. Wide open race. All button is preferred here. If not, I box the top 3 and then I box 5-3-1. Personally, I don’t like the race. 9th: 2-7-11-1-10-4-3…Another candidate for the all button, but for a different reason. There’s a bunch in this MSW that can win. I finally landed on Auntie’s the One (2) who ran a really good one last out. Better than it looks on paper. Waiting behind a wall of horses, until finally was able to get through. Clean trip here may be the difference. Malibu Royalty (7) ships in to new barn from California and if she takes to this grass could be very handy today. Sold for a lot of money as a yearling. La Manta Gris (11) should be tough in this spot, if the dead closer gets any kind of racing luck. Meister Legend (1) came with a rush in last at odds of 71-1. Any improvement today makes her tough. I bet the 2 to win/place and wheel over/under the rest. Take a small 2-7-11-1 exacta box as a saver. (Note: If the 15 draws in, need to take another look). 10th: 5-11-4-7-1-8…The G3 Matron is a tough one, especially if you consider that you have a G1 winner at ML odds of 4-1. Lady Fog Horn (5) is an Indiana-bred, but she loves this track. Throw out her last, against a monster and she fits right here in her third back off a layoff. Walkabout (11) has never been better and she has caught some of the toughest fillies for this level. Deep closer has a shot if she can get through. Tiger Moth (4) is trained by Brad Cox. Curlin’s Approval (7) is the 8-5 ML favorite, shipping in for trainer Marty Wolfson (who is the son of the man that bred the great Affirmed). Weep No More (1) won the G1 Ashland Stakes a year ago and ran in the KY Oaks. She is back after a long layoff and could definitely air this field with her closing kick if she is ready. I bet the 5 to win/place and key over/under the rest of them. I bet a 5-11-4-7 exacta box as a saver. 11th: 9-5-4-6-11-7-4-1…The card closes today with the G3 Louisville Handicap at 11/2 miles on the grass. Wide open affair, but I finally settle on the more accomplished runners in here, led by Danish Dynaformer (9). Doesn’t really like a soft course, but can overcome if he gets a clean trip from far back. Kaigun (5) has run the distance five times and has hit the board 4, with 3 seconds. Likes a soft going OK and may move up just a touch because of it. Caught a monster in the last out and this is the 3rd race off the layoff – key angle. Twilight Eclipse (6) is now an 8YO, and not what he once was; is he as good once, though, as he ever was? If so, figures here. Bullards Alley (11) is a distance expert and you have to throw in the unders here. Reporting Star (7) may be the speed that carries the best. I bet the 9-5 exacta and play them over / under the rest. 2nd (note that I skip the 1st and this race goes at 11:05 a.m. / theoretically): 2-4-6-10…Commend (2) drops back to his best distance – sprinting on grass. If ready, can air this field. Keep Talking (4) has been on my Horses To Watch List for a long time and should be ready to go now for a top barn. Love his breeding for the grass here. The “dot” horse here, though, goes to Grey Fox (6), who is a first-time gelding. Doesn’t win a lot, but hits the board nearly every time. I box the top three in the exacta and then wheel the 6 over / under and bet across the board. 3rd: Skip. Bet whatever is running at Churchill Downs. 4th (12:16 p.m. post): 5-3-4-2-7…Dharmaster (5) is a Bodemeister (could be a big day for this sire) and comes into this one off two really nice races after adding blinkers. The equipment change has really helped add focus to this one. Jamminwithbrandon (3) added the same equipment last out and woke up, too. Mr. Dougie Fresh (4) is trained by Kiaran McLaughlin and has shown some real ability, but can throw a clunker – like the last two on slippery going. The sleeper here may be Super Dude (2) coming off a maiden victory for trainer Linda Rice. Sold for a lot of money and won the first time out. Rice can train. I box the 5-3-4 and then the 5-3-2 in the exactas and play the 5 to win/place. 5th: 5-2-11-6-7-9…The Very One Stakes is like a lot of 5 furlong turf races – wide open. I land on Pretty Perfection (5) who likes a soft course and gets a huge jockey improvement. Throw out the last – when 10th on the turn. Back inside and may close with authority here. Everything Lovely (2) is one of the speedsters in this field and retains JJ Castellano to ride. Lost to the 5 in her last out. The sleeper here, though, may be Most Beautiful (11) for trainer Tom Proctor. Desperately needed her last out. If she can overcome this post, she could be right there – at 12-1 ML. I box the top 3 and then bet the 5 to win/place and wheel over/under the rest. I bet a little across on the 11, as well. 6th: Skip. Bet whatever is running at Churchill Downs. 7th: 1-6-7-8-9-2…the Maker’s Mark Chick Lang is a tough one, but I settle strongly on the “dot” horse and my “Bet of the Day.” Love Three Rules (1) in this spot. This Florida-bred has been hooking the best 3YOs in the country, evidenced by his loss to Always Dreaming in the Florida Derby last out. Turns back, finally, to his best distance and he could air today. Aquamarine (6) is 15-1 ML with Castellano and has been on my HTW list since he broke his maiden. Showed why in the mud at Keeneland, after being switched over to D. Wayne. Recruiting Ready (7) will be the favorite off two impressive runs lately. Theory (8) and Bobby Abu Dhabi (9) add depth and intrigue. But I will bet the 1 to win/place and then key over/under in the exactas. Play all/1 as a saver in the exacta. Key in the pick 3 ending here and starting here. 8th: 4-6-10-12-5-3-2-7…The James W. Murphy Stakes goes at 1 mile on the turf. Tough field, but the top 3 numbers get the best here. Dover Cliffs (4) gets the first “dot” in this one. Winner of two in a row at GP and should be very tough in this spot. Yoshinda (6) is a Japanese-bred who aired in a MSW at Keeneland in his last out. Gets the other “dot.” Throw in Adonis Creed (10) who prefers the grass and likes it a bit soft, as well. After the top three, I cover deep. So, I box the top 3 in the exacta and then wheel the top 3 over/under the rest in case a number pops. I bet the 4 to win/place. 9th: 5-4-9-6-2…The G3 Maryland Sprint attracts a top field, led by two superstars of today. I go with Whitmore (5) on top, since he has been on a super roll since the debacle in last year’s Derby. He hooks a good (great?) one in A.P. Indian (4), who looked like a sure winner in his seasonal debut at Keeneland before caught at the wire. Needed that one, probably, and should improve. No value in boxing these two, so I take them over/under the other three above. And, I bet 5 to win/place. Use both in the Pick 3 finale and begin another one here. 10th: 6-7-2-10-3…The G3 Gallorette is wide open, as most grass races usually are. I settle on the favorite, On Leave (6), trained by Shug McGaughey. Coming off a layoff is a concern, but she has done it well before and likes a soft turf. This daughter of War Front is a good one. Have to support her with Elysea’s World (7), who likes it soft as well. Two huge seconds to one of the world’s best turf fillies right now, Dickinson. Will be salty. Zipessa (2) has solid credentials, but prefers a firm footing. Cambodia (10) is another Proctor horse, who draws extreme outside. Just nipped by Believe in Bertie two back. That one came back to run a huge one at Churchill on Derby weekend. I bet the 6 to win/place and box with the 7. Then I wheel the 6 & 7 over/under the others. I play the 10 a tad across the board as a saver and use in Pick 3s. 11th: 2-9-10-1-4-5-8…The Sire Barton Stakes gets a solid field and picks up two “dot” horses here. I love Hedge Fund (2), who lost the Illinois Derby by a whisker to the fast-closing Multiplier. Ran third to the highly touted duo of Hence and Conquest Mo Money in the Sunland Derby, too. I give the edge to him here, with the pickup of JJ Castellano in a huge jock improvement. Time to Travel (9) gets a similar jock improvement with the addition of John Velasquez, but also adds Lasix today. Faded in the Lexington Stakes in last, but was right there against two very nice horses in Timeline and Giuseppe the Great in his first start for a barn that is notorious for not cranking them up early. Have to use. Resiliency (10) is 15-1 ML and I think bounces back greatly today. Value play here. I bet the 2 to win/place; key the 2 over/under the rest; and then box 2-9-10 in the exactas. 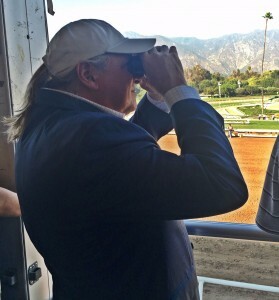 12th: 4-10-2-7-1-8…The G2 Longines Dixie is wide open, but I go for a hot trainer/hot horse that is not as accomplished and/or experienced as some of the rest. Projected is a typical pickup by Chad Brown, and these types excel under his watch. Big win over Divisidero at Keeneland and you know how much I like the latter one, who ran huge on Derby Day. Ring Weekend (10) should run back to old form today and he loves a softer going (that’s why I thought it was strange the connections left him in California for so long). World Approval (2) is solid, as well. I play the 4 to win/place and then key over/under the rest of the numbers above. Box 4-10-2 in exacta as cover. 13th: 4-5-6-8-9…The 142nd running of the Preakness Stakes. Listen to the podcast and you know what I am doing here. I am keying Always Dreaming (4) and Classic Empire (5) over/under Gunnevera (6), Senior Investment (8) and Lookin at Lee (9) in the exactas. All three of the “others” have been featured on The Pressbox this week. I will also play the 6 across the board. Think it is his day and time.